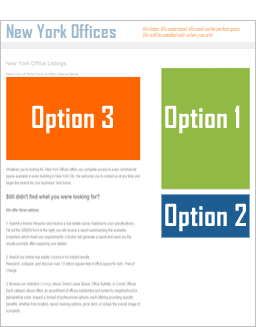 New York Offices can show you available office space in Manhattan, NYC exclusively. Browse our listings online for the available office near you or call us and we'll put together a real estate report detailing all the available space which meets your business needs and matches your budget. We can setup a tour a view any office space in any of the following neighborhoods: Chelsea, City Hall, Grand Central, Penn Station, Herald Square, Plaza District, SOHO, Tribeca, Gramercy, and Midtown Manhattan. Save time and avoid fustration, you can depend on an industry leader like us at each and every point of the deal. As tenant brokers our responsiblity is to our Clients (the Tenant), as such you don't pay our fee in commercial real estate; the landlord does. If you'd like an immediate call back just fill out the form to the right; if not then you may either SEARCH for a space yourself utilizing our Online Database of Offices or browse our site Listings which are organized by neighborhood and square footage.